We would like to send out a sincere ‘THANK YOU’ to everyone who braved the winds on Saturday and came out and supported our ride this year. We have been so lucky to have met so many wonderful people putting on this event over the past 15 years and Saturday was no exception. Everyone came out with such great attitudes and tons of enthusiasm and all of you really lifted our spirits. Have to be honest…. we were all a bit down Friday and Saturday morning because of the weather, but as soon as we saw all the determined riders line up for the 7 a.m. start to the 80 mile ride… those feelings all went away. All of you sucked it up and powered through one of the toughest weather days we’ve had… and you did it with smiles on your faces and with gratitude. ALL OF YOU are the reason we keep working hard to make this event fun and memorable. The wonderful feedback and gratitude you have shown us over the years makes all the stress and anxiety of putting on an event like this more than worth it. We appreciate each and every one of you and we truly hope that our hard work and efforts measure up to your standards. You all did an amazing job out there Saturday and your positive spirit and determination were inspiring for all of us to experience in person! 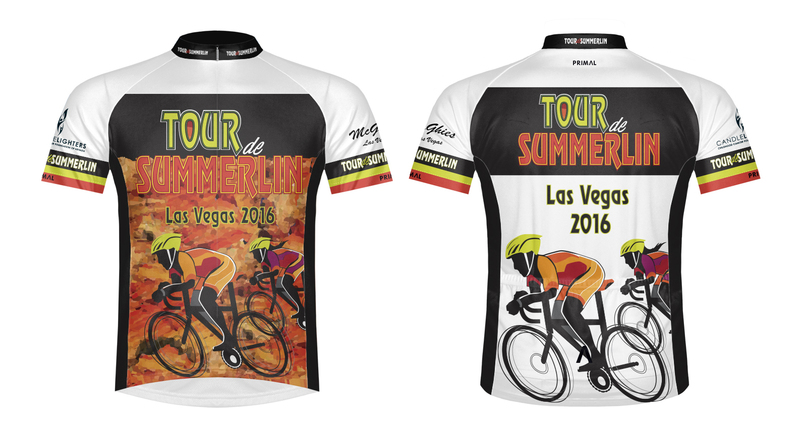 You can now purchase an official 2016 Tour de Summerlin event bike jersey. What a great way to commemorate your participation in this fun and exciting event. Jersey’s are available for online purchase at McGhies.com or just click on this link. Early registration pricing is now in effect so hurry up and sign up before the rate increase happens! You can register on Active.com by simply clicking on the ‘online registration’ link on our website. We do have a limited number of entries for this years event, so make sure you reserve your spot today. Tour de Summerlin is Southern Nevada’s longest standing bicycle event (now in our 15th year). This years event will again start and finish at the beautiful and convenient Downtown Summerlin. We had a record turnout in 2015 and hope to see everyone back for another fun-filled day of cycling and camaraderie! 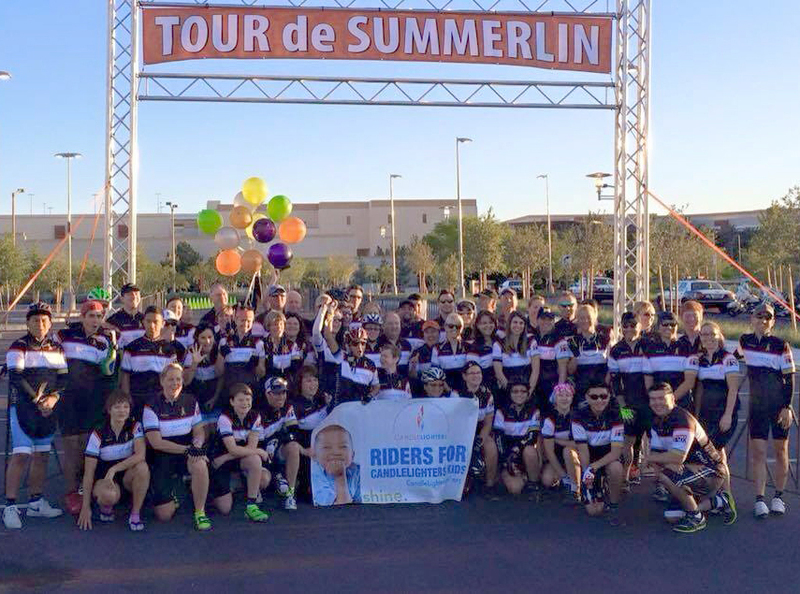 Mark your calendars for APRIL 16TH, 2016 for next year’s Tour de Summerlin. This will mark our 15 year anniversary. Please follow us on Facebook and Twitter for event updates and news. We are so appreciative to all the sponsors and participants that make this event the longest running bicycle event in Southern Nevada. We’re looking forward to partnering again with the Candlelighters Childhood Cancer Foundation of Nevada. 2015 marked yet another outstanding effort by the Riders for Candlelighters Kids Group. Their efforts generated over $80,000 in donations for the organization. Congratulations to all of these amazing people for their commitment, dedication and compassion for helping others. Candlelighters Childhood Cancer Foundation of Nevada (Candlelighters) is the first and oldest non-profit organization in Nevada serving families coping with childhood cancer. Candlelighters mission is to provide support, education, hope and advocacy through programs and services for children and adolescents with cancer, their families and the professionals who care for them. We assist families who are affected by childhood cancer, who request help with financial assistance, patient advocacy, and programs addressing the families’ mental and emotional health needs. We are proud to have helped thousands of families since our founding in 1978. There is still time to register for this year’s event. Just head over to McGhies Ski, Bike & Board located at 4035 S. Fort Apache Road from 12 noon to 7 p.m. 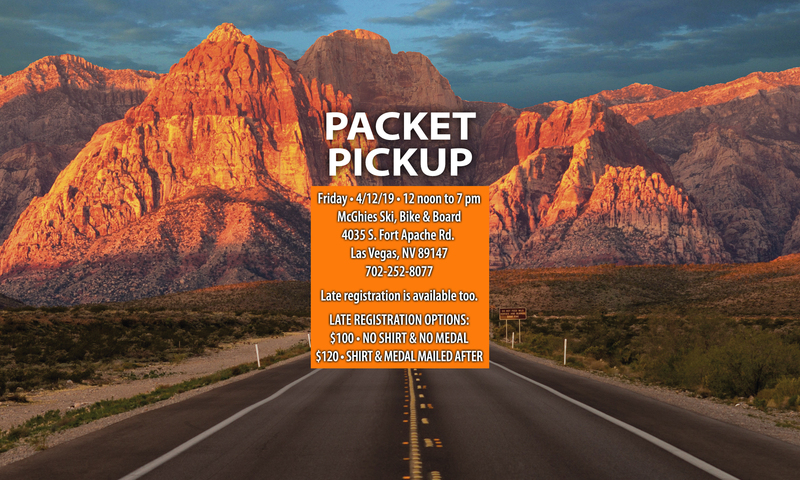 Please note only pre-registered riders will receive their shirts at time of packet pickup. We will take size requests from all late registrants and place another shirt order the week following the event. You will be able to pickup your commemorative shirt within a week to two weeks at McGhies. Thank you and we look forward to seeing everyone out there this Saturday! Please make note that we have made some adjustments to both our 80 mile and 60 mile routes for this year. It has always been our #1 priority to keep our riders as safe as possible by providing routes that minimize heavily trafficked areas. Please go to our RIDES page and download the newly updated routes if you are planning to ride the 80 or 60 mile routes. These updated routes should provide for a safer and more enjoyable riding experience. Please make sure to share this information with family members or friends so they can download the new map. We will be providing printed maps which will be available at packet pickup. Thank you!